China is lending Hong Kong one of its most important relics, to mark the anniversary of the Buddha's birthday. A relic purported to be the Buddha's finger has been flown to the territory in time for the celebrations on Wednesday. But critics have dismissed the move as a political gesture to appease the people of Hong Kong, many of whom are angry after China refused to let the territory directly elect its next leader in 2007. The former British colony returned to Chinese rule in 1997, and opposition leaders claim Beijing has not honoured a promise to give it a high degree of autonomy. "Beijing is trying to get close to Hong Kong people and cool the heated political atmosphere," Hong Kong pro-democracy lawmaker Lee Cheuk-yan said of the finger's loan. "This is part of China's propaganda exercise," he told the Associated Press news agency. Lee Cheuk-yan compared the event to last year's visit by China's first astronaut Yang Liwei, which critics saw as an attempt to foster a sense of Chinese nationalism in Hong Kong. Whatever the motive for the loan, the transfer of the Buddha's finger was accorded full pomp and ceremony. Before it left China's western province of Shaanxi, more than 1,000 people attended a ceremony at the Famen Temple where it is usually displayed. 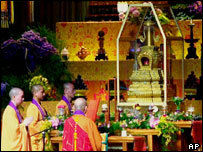 On its arrival in Hong Kong, saffron-robed monks escorted the finger from the aeroplane to a truck decorated with lotus flowers. The finger was found among a number of other Buddhist relics discovered in an underground shelter at Famen Temple in 1987. It is believed to bring peace and luck. Several other relics thought to be parts of the Buddha's body - including a number of teeth - are preserved in various monasteries in Asia. The finger may be getting a reputation for its links with political diplomacy. In 2002 it was loaned to Taiwan, which China is keen to woo away from pro-independence voices on the island.